Mr. Minx here with another story about a quick, easy dinner concocted on the fly. Most days, I don't think about what I'm going to cook for dinner until about 30 minutes before I have to start cooking. It's not that I don't like cooking; I just don't like to think about cooking. This is especially true when I've been busy all day and there isn't anything in the fridge that immediately sings to me. This was the exact circumstances I was faced with a few days ago. What to do? Well, I started by looking for some kind of protein. Fortunately, the Minx and I had just purchased some salmon fillets from Trader Joe's the previous week. We both like salmon, but I always seem to overcook it. There is such a fine line between underdone and dried out. Also, using frozen salmon that's been thawed tends to bring out all the nasty albumen, which is not appetizing to see or taste. Mix the ginger, garlic, sugar, soy sauce, mirin, water, and rice vinegar in a bowl. Sprinkle in most of the chopped scallions, retaining some for the garnish. Pour the mixture into a pan and bring to a boil over medium-high heat. Turn the heat down to low and lay in your salmon fillets. Cover the pan and allow the fillets to cook in the liquid for 5 minutes. Since the cooking time will vary depending on the thickness of the fillets, check to see if the fillets are cooked all the way through by gently slipping a knife into the center and creating a small opening. If the middle is too mushy and red for your taste, put the cover back on and allow the salmon to cook for a few more minutes. Once the fillets are cooked, remove them to plates. Turn up the heat on the poaching liquid and allow it to reduce to a slightly thickened sauce consistency. Cover the fillets with the sauce and garnish with the remaining scallion bits. 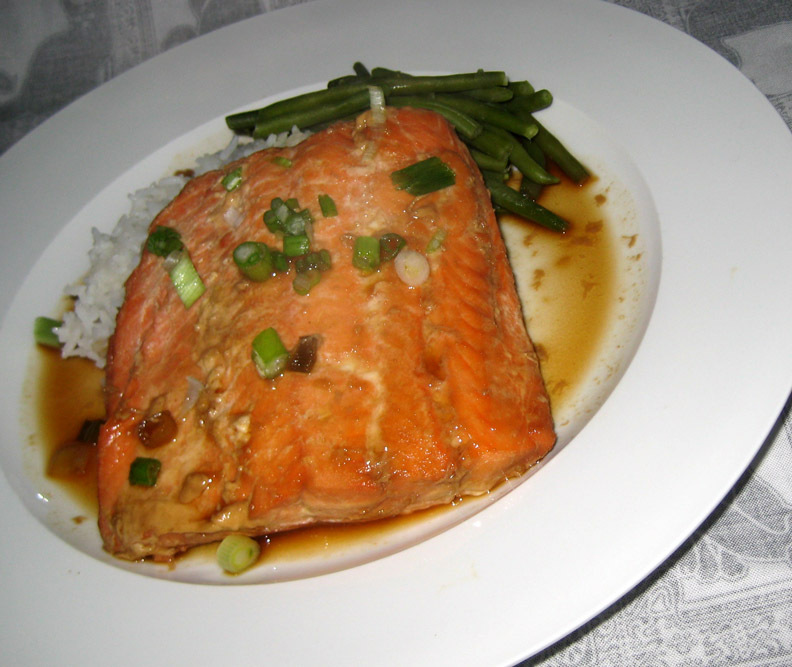 I served the salmon with some steamed rice and petite string beans. The whole meal went from concept to plate in about 45 minutes. That's my kind of cooking!